The haul-out was postponed from Wednesday to Thursday to Friday. By 3pm on Friday, there was still a monohull on the boatramp — who knows why, it hadn’t been moved in 2 days, and was blocking our exit from the water onto land. I was getting ansy and went back to the office (again) to check the status. “You keep coming here every 5 minutes! How do you want us to do anything! ?” Tony hollered impatiently. “I assume you don’t work tomorrow?” I countered, hiding my shock at his apparent anger; just trying gently allude to the time sensitive nature of my presence. “Nope,” he smirked. This was the first time I can remember someone in French Polynesia being angry with me. I just shrugged my shoulders and mentioned, “well, it would be great to know so I can prepare.” Tony walked away fuming to move the monohull, saying he’d call me on the VHF. The family running the boatyard is really great, from the grandparents to parents to the workers — all creating a wonderful sense of community in this isolated patch of dirt, mid-Tuamotus. However, Tony is getting stressed. The number of boats in his yard went up from 20 to 30 to 40 this year. Besides office related issues, which his mom addresses, every type of technical question must be fielded through him. There is no second person in command that he’s training, at least that I’m aware of. He’s putting too much pressure on himself. Back on Aldebaran at anchor, I saw with binoculars that the monohull was getting moved. Well, that looks like a sign that things are happening, I thought. I hoisted the outboard engine and dinghy on deck, which takes a good 25 minutes alone. Then at 4:30pm, I got the call from Apataki Carenage; I lifted anchor and motored towards the boatramp. The conditions were calm and perfect. In an idyllic beach setting, Aldebaran settled between the trailer’s pads. Visibility in the water was clear, with sand below. This was markedly nicer than in the Marquesas, where a rainstorm had dumped piles of wood onto the boatramp. To align the boat with the trailer straps, I had to dive in murky water through the wood debris. Tony and crew tried a few different techniques to align the boat with the trailer. There is a “catamaran setting”, with the hydraulic pads horizontal — which was just a tad too narrow and pinched our main hull. 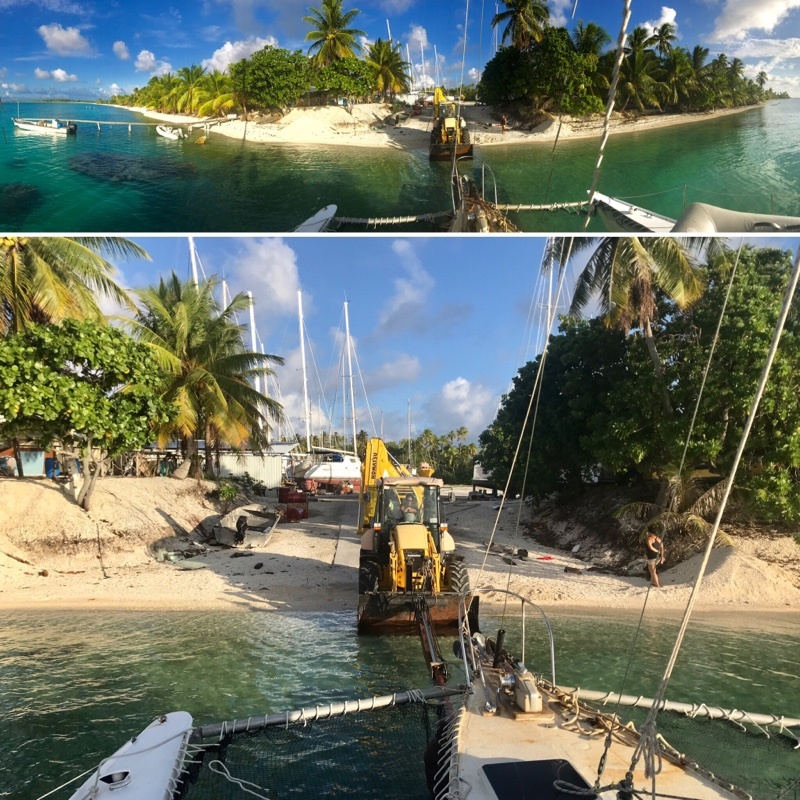 The same thing happened in Marquesas with their hydraulic trailer, so they decided to haul us up with the “monohull setting”— with the hydraulic pads in diagonal position. Then on Monday, I returned, to discover that they had ordered (that same morning) $1000 of paint for me from Tahiti. “Wait a second, are we even sure we’ll be able to haul out?” I asked Pauline, Tony’s mom at the office. “Oh, are you saying you need to cancel the order? If so I need to know right away.” She immediately walked out to inform Tony, who flipped out at this possibility, and before we were able to discuss any creative solutions to hauling out Aldebaran, he announced angrily he’d cancel the order and he didn’t want to see me again. I feel sorry for Tony. He did an amazing job creating the infrastructure for a professional boatyard in the middle of nowhere. Lots of sailors haul out with him yearly, and are extremely satisfied. But I witnessed him at the “final straw that breaks the camel’s back”. He’s clearly over-doing it. I’m worried he won’t be able to keep up the proper operation of the place if it’s growing and everything rides on him. I walk away feeling sad at the poor relations, but as far as our haul-out being cancelled, I’m at ease. I had the weekend to figure out a backup plan. It’s time to shift gears. Outstanding equanimity and compassion. If only we all had these virtues.